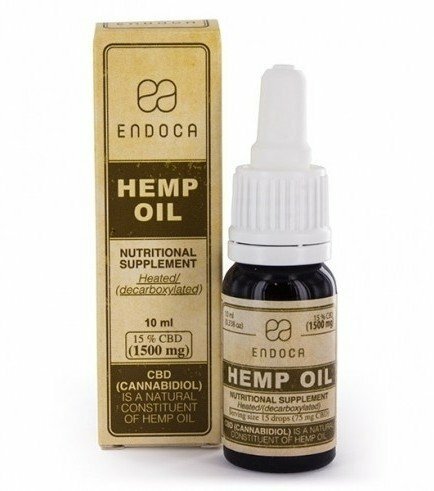 Endoca Hemp Oil (15% CBD) is super concentrated, CBD goodness in liquid form. Each drop contains 5mg of CBD and each 10ml bottle contains 10g of hemp oil with a total of 1500mg of CBD. All CBD products produced by Endoca are sourced from organically grown hemp, pesticide-free! Keep refrigerated after opening and shake well before use. Endoca’s highly concentrated hemp oil drops contain only pure and organically produced European hemp oil. No pesticides or herbicides are used in the production of the hemp itself and not a single additive or filler is used. Hemp oil also contains Omega3 and Omega6 fatty acids and Vitamin E, which add to the CBD oil's list of benefits. Endoca Hemp Oil (15% CBD) can be used up to three times a day by dropping under the tongue. Store away from sunlight, heat and humidity.